It's a quick turnaround for the Reds as we return to action with a trip to FC United of Manchester tonight in the National League North, kick off is 7.45pm. After Saturday's explosive encounter with Chester which saw five goals and two red cards, with the Reds losing 3-2; Billy Heath will be desperate for a return to winning ways in the league tonight. The Reds will be buoyed following progression into the FA Cup First Round and a tie with League One Fleetwood Town in a few weeks. With the fixture also being selected for BBC single camera footage and moved to the Sunday programme, the Reds will no doubt be eager to cause a shock in that fixture. Alfreton will also be looking avenge the result from Saturday, after falling behind after just three minutes due to a soft penalty, we fought back and equalised thanks to Reece Styche on his debut and Bobby Johnson's free kick. James Clifton then was sent off with a straight red card which again was hotly contested as the challenge looked like a yellow. Even so the Reds held out until half time 2-1 up. The second half saw Chester fight back and level the contest, only to go down to ten men themselves for a foul on Craig Hobson with ten minutes to go; however a last minute penalty was awarded against Josh Gowling even though the Reds centre back clearly won the ball in the box. Gary Roberts stepped up to complete his hat trick and hand the Reds a heartbreaking and undeserved defeat. We head into tonight's first meeting with FC United on the back of five league defeats in a row, including losing our last three away league games. Although the form doesn't present happy reading or feelings, the performances the Reds have put in haven't warranted this slump down the table. With fine margins, poor decisions and a lack of concentration all being factors that have led to defeats in the last five league games, Alfreton have showed enough strength and quality to get points back on the board and climb back up the table. The Reds will be looking to respond from Saturday and end the losing run and this time ensure the result matches the performance. FC United bode a tough test, especially at Broadhurst Park; with new manager Neil Reynolds joining the club from Bamber Bridge and beginning his reign with a 1-1 draw at home to Brackley on Saturday, another tough outing is expected. FC are unbeaten in their last two league games (D1, W1) but that win is FC's only win in their last ten league games. United haven't won at home so far in the league this season. £12 Adults, £7 Concessions, £3 under 18s. Turnstiles officially open at 7pm but there will be an early turnstile from 6.45pm. 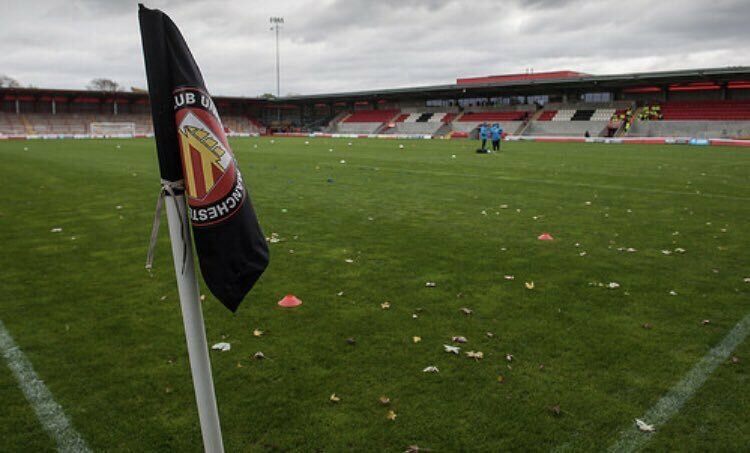 For Reds fans travelling by car there is a charge of £5 to park at Broadhurst Park and £3 at the nearby St Matthew’s School, only a three minute walk from the ground.